On February, 8th I’ve been at the Lift 13 Conference with Davide to present our workshop about Social Usability. Social Usability is a quality attribute that assesses how easy social interactions are to make. We proposed the Social Usability Checklist as a tool of analysis and design for social network dynamics and apps. It was a great experience with several interesting questions, solutions and feedback. I want to thank all the participants that made it possible. Sherry Turkle: Connected, but alone? Sherry Turkle doesn’t need an introduction. She’s one of the most famous Psychologist in the digital technology and mediated interaction fields. All new technologies bring with themselves opportunities and risks. 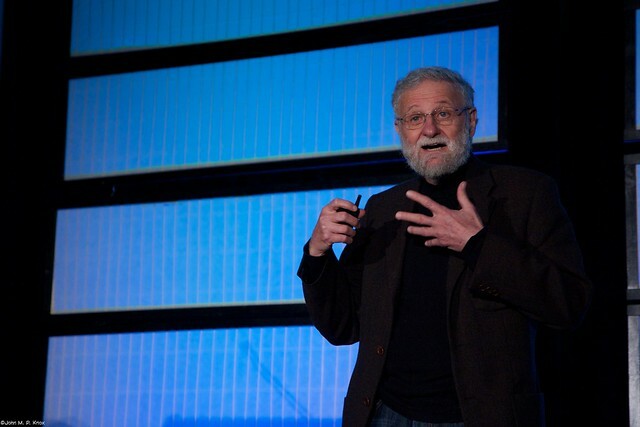 Turkle shows how the social digital interaction could be a mirror of our personality, our fears and our talents. An other important example of how the social networks, the pervasive mobile are a real, strong extension of our relational world, experience and capacity. We have to learn and to spread new psychological competences, like the emotional intelligence. The social digital interaction push us to be more aware of ourself. It’s an unstoppable change with risks and opportunities. At the same time the Interaction Design, the User Experience Design need more and more psychological competencies. Technology and human are part of a co-evolution and the product influences the producer. Scritto il 4 aprile 2012 Categorie AppuntiTag mobile,psychology,Sherry Turkle,Social network,TEDLascia un commento su Sherry Turkle: Connected, but alone? PSIxD means Psychology applied to Interaction Design. It’s the evolution of digital interaction as a psychosocial space, that is able to create new variables and dynamics. UX Researchers are expert of the cognitive level that is necessary to achieve a good experience and usability and at the same time Anthropologists bring fundamental competences in understanding ecosystems, cultural differences and real-world behaviors. PSIxD brings to the table another piece of the puzzle, helping designers to analyse and design the relevant motivational and psychosocial variables driving social network dynamics from the beginning to their maturity. A Social UX Researcher is someone that has these kind of competences, it’s another step in this field and it’s even part of a the expression of a new alliance between Psychology and Design. Less errors due to more comprehensive and detailed valuation of past and potential projects. More understanding from a deeper knowledge and more data about users and network to make better analysis and more informed design choices. Higher probability to induce certain behaviors in users and groups. More criteria to manage the evolution of the community. Scritto il 20 aprile 2011 Categorie AppuntiTag design,IxD,Norman,PSIxD,psychology,UXLascia un commento su What is PSIxD? I think that it’s time for a second new alliance between psychology and interaction design. The evolution of the interaction as a social space needs new psychological points of view. The psychophysiologic, cognitive and behavioral points of view (part of the history of human computer interaction, from the beginning) are fundamental but not enough for the new variables, factors, dynamics and levels that emerge in social networks. The evolution of the mediated interaction as a social space is changing the user from just a behavioral and cognitive system in a more complex cognitive psychosocial and psychodynamic system. During the event Meet the Media Guru in Milan, I asked Donald Norman an opinion about my point of view and this is his answer. I think that these challenges and opportunities can’t be solved by anthropology that is too narrative as discipline. The alternative isn’t the reductionism but a balance between different psychological approaches. Scritto il 27 marzo 2011 Categorie Autori,Design Motivazionale,Ibridazioni,Interaction Design,Psicologia dell'Interazione Applicata,Scenari Futuri,Social NetworkTag DonNorman,IxD,Meet,Norman,PSIxD,psychology,UXD1 commento su Donald Norman agrees! From 1995 to 2005 knowledge management consultancy had the principal objectives of helping companies to create and share knowledge as a value to innovate internal process of the organization with the support of IT. Today it’s easy to know that triggering collective behaviors requires more than a good information technology, but for years many companies spent a lot of money and time in projects too much focused on technology. The results were expensive intranets and professional communities with lower adoption and use. Why did this happen? Because for the companies it’s difficult to involve its internal culture as a group of people. Enterprise 2.0 tries to be a solution using the web 2.0 social apps. In fact the 2.0 apps have implicit social incentives inside their structure and logic, which help the users to adopt technology and new collaborative practices. I call this effect indirect social adoption. But the difficulties for the companies to involve their internal culture isn’t so easy to solve and something wrong appended in Enterprise 2.0 consultancy as well. From 2006 until 2010 many consultancy companies of web design and interaction design reduced Enterprise 2.0 to a matter of design. The result was better usability, better software and user experience solutions, indirect social adoption but, frequently, some of the old problems of participation have remained. Why? Because within companies there are strong and implicit dynamics that can influence the professional relationship with the consultants. The free choice of a user to be a part of a social network in Web 2.0 is profoundly different from a user-employer in an intranet that he must adopt. The problem is not design itself, that’s fundamental, but the reductionism of the approaches. The companies need a methodology that can help them involve their organizational culture in the easiest and most basic. In fact the knowledge management objectives are the result of the practices of participation and collaboration both off line and online. Why aren’t collaborative apps enough? The Enterprise 2.0 strategy of using social apps to nudge collaborative behaviors is absolutely correct and I too use it with a psychological approach to interaction design. But it isn’t enough because the organizations aren’t just rational systems but groups of people with strong implicit dynamics. When there’s need to change some practices, processes, or responsibility the irrational subcurrent of the company can produce resistances. In other words, sometimes, the organization needs to help itself. It isn’t a scandal, these are normal dynamics in all complex groups such as companies. Consider, for example, how Chris Argyris describes the resistance in organizations (one of several). This in nothing new, it’s a classic problem. What’s new is the role of IT and design to help the company create a process of change management by an integrated approach. Generally the challenge to nudge new behaviors in a company can’t be only a good work of social usability because the resistance to changing technology and collaboration habits are stronger in employee-users than web-users. So, it’s important to combine the user-test with an alliance with the group before building inside a community. 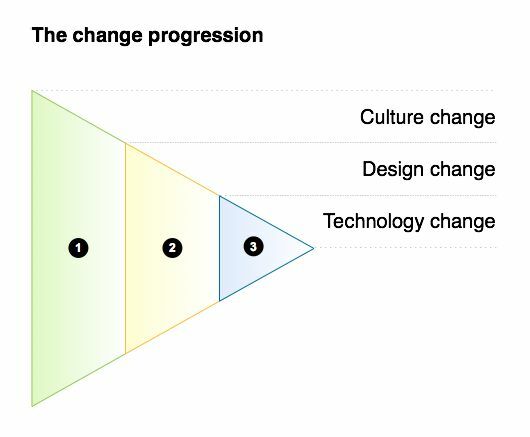 I synthesize the integration of change management and design in a simple diagram of change progression. It represents the priority of levels that make possible new practices of collaboration and participation. The proportions of the diagram don’t necessarily correspond with the amount of time needed at each level. Only when the client understand that the community are, first of all, expressions of the group of origin and then, only after this comprehension, there is the possibility to design a community that can give a good influence on the group in the organization, closing the loop. This method co-designs participation and collaboration, making new spaces of change management and incentive by organizational culture and psychology applied to interaction design. How put together social software, interaction design and change management without creating an overly consultancy and/or a simple sum of approaches? The psychosocial variables of collaboration are the links between the organization (as a group of people) and the community (as an alternate social space) to nudge behaviors. This is the fundamental mind shift that make it possible to put it all together. The community becomes the alternative space of work and socializing. Social needs and dynamics become intrinsic incentives that can nudge collaborative behaviors. The group of professionals in the organization can find in the community a digital space to change itself in more collaborative and efficient way. How? See for example, the process of social presence. The interfaces and the interaction human-machine-human are a cyberpsychological space where we can use new tools to promote and assist bottom-up change. In my approach the objectives of an Enterprise 2.0 project is to nudge a co-evolution between group and community. Thus, psychosocial variables are the point of union between organization, social platform and community. I’m not an interaction designer but I help them to create participation and collaboration in the community. I do it by managing the resistance of the organization and making a stronger relationship between the psychological characteristics of the group. At the same time I’m not an engineer but I help IT consultancies to create a better convergence between the objectives of the client and the functional needs of the users. Minimal, because the approach involves the smallest part of the organizational culture to be less invasive and as easy as possible. Change, because is the top-down phase of change management with the managers. This important moment is founded on a relation of consultancy with the client and not of service. Without this kind of endorsement is difficult to help the organization to work by itself. In first analysis we find and divide the IT, Design and Cultural variables that caused the limits and problems of past intranet and community projects. It’s very important to show the client the effect of the different levels on past projects. The results of this analysis help the client to understand the role and relevance of cultural variables and internal resistance that can be obstacles. At the same time it’s easier to define the specific necessity and role of each levels to build a better social platform and community. After the analysis there is the moment of rethinking the knowledge management and collaboration objectives in relation to the results. This is the moment to help the client select the minimum part of organizational culture that is necessary to change. The effect is double, both removing the obstacle (for example, the fear of writing an opinion in the community that blocks the production of contents) and adding an incentive (for example, the need to be a part of a group). These choices will influence the design, the communication and the community management strategy. The map of the minimal change will be a guide to make a community with more motivation because the incentives will not be delegated only to a generic social design but will be both an expression of the needs of the real group of origin and characteristic of that group. Sometimes it is necessary to help the managers coordinate the different parts of the company and find endorsement from top management on the objectives and changes. Generally it’s easier to start with a prototype with a single professional community to reduce the possible problems with other components of the company. A large number of Enterprise 2.0 projects failed because they didn’t find the right legitimation from the top and a gradual compromise with other parts. It’s fundamental to make a priority of clear strategical objectives. In this phase we have to create bridges between the future community and the social platform. 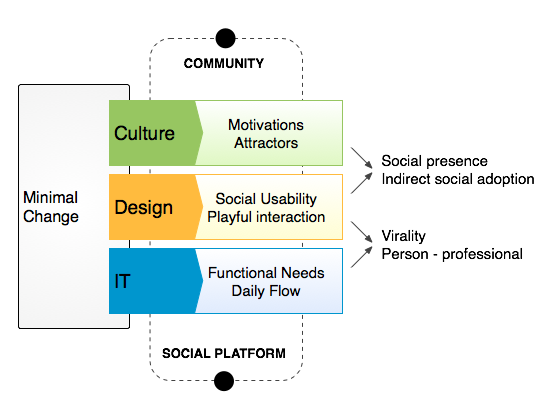 The three levels, IT, design, culture (which the preliminary analysis investigated) are the levels between the community and the social platform. Generally the end of the Minimal Change starts with the begging of the cultural level of research and design. In particular with the selection of the attractors. I call attractors (as in complex systems) the implicit leaders that will be selcted as early adopter of the platform with the capacity to involve other users. This is a phase of research, engagement and change management at the same time, because the attractors don’t always correspond with the hierarchical structure of the company. I use the model of the Relational Motivation to code the values and practices of the organization inside the process of design. It’s important to have models and tools to put in relation the original group and the future community. In fact community, first of all, will be expressions of the limitation and potentiality of the group. Social Usability is the models and the tools that help Interaction Design to integrated psychosocial dynamics. Look, for example, at the Social Usability Checklist. Variables such as R.I.C.E. (Relations, Identity, Communication and Emergence of groups) are the principal psychological dynamics that influence the behaviors of user in a social network. There’s a interesting scientific literature about it that can help us to go out of a generic design approach. Playful interaction is the strategic use of playful components to improve adoption and diffusion of the platform and collaborative practices. For example the strategy of releasing apps and functions could be put in relation with how the user use the platform. Gamification isn’t something very new, but it’s absolutely an important way to incentivize. Functional Needs and Daily Flow are the phases necessary for selecting technology and services. The logic is to put the user in the center of design, in other word, it’s the functional side of User Centered Design. If we don’t consider the professional operational needs, the information overload and other cognitive and technical variables, we could have big problems with adoption. This integrated approach to design makes explicit many variables that generally (for low competencies, limited approach or resistance) can be lost or can create unpreventable problems in the phases of adoption and diffusion. At the same, this approach, makes possible a multifactorial design from the interface’s variables to the dynamics of the group. You can see a synthesis of this model of PSIxD here. As you can see in the last diagram, after the phase of PSIxD there are the four process (or we can call them dynamics) that I introduced in the third post. Why? Because they are the dynamics that influence the experience and behaviors of the user in the community. With the title co-evolution I want to indicate the community’s levels of evolution. In synthesis, after the phases of adoption and diffusion the community enters into the first level where it isn’t just an expression of the group of origin but influence it. The process of co-evolution is the last objective of an Enterprise 2.0 project. It’s a circular influence between community and group, that helps the organization to control the behavioral evolution of users and make the necessary changes to be more efficiency, in a collaborative way. There are many components in this phase (communication campaign, community management, weak signals, Social Network Analysis) to nudge and manage the community’s levels from adoption to co-evolution, so I’ll dedicate a specific later post to these. With this fourth post I finish the introduction to my Enterprise 2.0 approach. The objective was to give a the general view of all competencies, levels. In future posts I’ll go more deeply into it, to describe some specific tools, process and phases.